Gainesville Coins, Inc. has once again raised the bar when it comes to online coin sales. With Halloween just around the corner, the stock market isn’t the only scary thing anymore. GCIGOLD.COM has been over taken by ghouls instead of gold. The themed website features an animated haunted house, as well as the occasional flying bat, and crawling spiders. 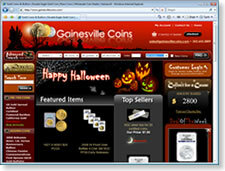 For the month of October, Gainesville Coins will have a Halloween themed website where the customer is greeted by pumpkins and ghosts along with the normal low prices. With investors jumping in to metals to safeguard from the uncertain economy, GCI customers are noticing that their prices are sweeter than the candy kids will be collecting later this month. As always you can find specific coins using the interactive search bar, or navigate by category to view their inventory of rare, modern, and bullion coins. For more information about Gainesville Coins and their upcoming promotions, contact Tyler Callahan at 352.653.3009 ext 315 or Tyler@GainesvilleCoins.com. The staff at Gainesville Coins is comprised of highly experienced and knowledgeable numismatists, dedicated to helping our customers have the best coin buying experience possible. Our hard working employees thrive on close personal relationships with one goal in mind, to make each customer’s interaction with us quick and easy. Whether you are a novice buyer or a seasoned collector, we will tailor our services to each individual’s personal wants and needs.